If you are still thinking of your bike while you leave it right outside your home, school or your workplace, then you have to look for the best bike locks that can keep your bike in a very safe situation. 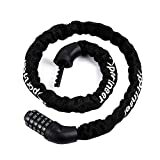 All the bike lock are not the same and not all the locks can make sure that your bike still stay at the same position when you return so that is the reason why it is quite challenging when thinking of choosing the best one. We have come across 10 best bike locks and we are going to review them one by one now. We are going to start our review with the best bike locks from NUNET. It is one of the keyless one that we have found. What you need to do is downloading the app on your device and connects it with the lock via Bluetooth so when there is anything happen to your bike, there will be the notification pop up on your device. The cable is made of braided steel that is cut resistance and work well with most bikes, motorcycle, gate and such. Plus, this Bluetooth bike lock requires 3 AAA batteries to stay active and it will last for about 8months use only but you do not need to worry much since it will alert you when you batteries remain 20%. With this one, you do not need to take your keys along anymore. Either you want to unlock or lock it, you just need to remember the combination only. It is made of high grade steel which is very strong and resist well with the water and can secure your bike perfectly. It comes in light weight (1.2 pounds) to make it easier for you while carrying around in your bag or putting around your bike seat. This one is very easy to use since your kids can also use the lock without you worrying that the keys will be lost. The third one that comes in line is the one from Sportneer. 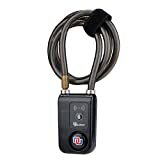 It is one of the keyless bike locks that come with 5 digit combination technology. You can set and reset your password very easily. Combining the 5 digit correctly is how to unlock a bike lock. The bike lock is made of the manganese steel that is cut resistance and is very perfect at preventing itself from scratching. The cable is very long and covered by flexible cloth sleeve that resists well with water and dust and last for a very long time. 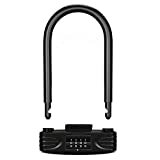 The bike lock from Amazer is also one in our bike lock reviews as well. It is way more convenience to just remember your digit combination rather than carrying your keys around. It will come with the factory setting combination but once you own it, you can reset your own password by yourself very easily. The chain itself is covered by the weather proof cloth sleeve that can prevent itself from scratching, sawed or drilled. The chain lock comes in 1.55 pounds which is light enough to carry or lock on your seat post. Anyway, it is good at keeping your bike safe even if you lock it to a tree or railing. 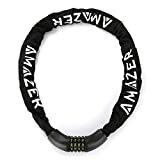 Amazer has brought one of the best bike lock to the market. Amazer will guarantee to keep your bike safe with the brand new U lock which is made of shackle and covered by PVC coating to prevent itself from getting cut as well as getting away from scratches. It is the easiest lock ever that can be unlock with just 4 digit combination which could make sure that no one can guess your combination. The combination spot is covered by a dust cover as well for long life use. Get this to keep your bike safe and away from scratches. This one comes to replace all the chains that you are always used to secure your bikes, motorcycles, tools and such. This lock master can withstand well with the pressure up to 1,500 pounds so even if you use it for heavy duty, it will still be fine. It is very convenient to use and can take care of your things well. It is made of vinyl coating steel that prevent your objects from any scratches that could possibly happen when locking your bike locks. In addition, it can resist well with weather including rain, snow and so on. Krytonite has released another best lock to the market to help you well in keeping your objects safe. It is the lock that is made of the hardened steel and vinyl coated to prevent the frame from getting damage. You just need to mount this to the conjunction to secure the whole body of your bike. It is attached to the side mount and snap in bracket for easy installation. There will be another 2 stainless steel keys included in a pack and Krytonite guarantees to deliver the high quality security product. Another best key lock comes in line is the best one from Blusmart. It is the 5 digit combination safety lock which makes sure that only you know the combination. It comes with the original password but you can change it immediately after purchasing it. The lock can resist well with cutting tools and there is another strong and durable cable inside the transparent coating which let this one can withstand well under the hard pressure. It is very easy to mount and keep your bikes away from scratches well. Let’s get to another durable bike lock from Sigtuna. This is the high quality lock that guarantees your bike’s security even in low or high risk block. The cable inside is made of steel and flexible enough to let you mount it under your bike seat very easily. Especially, it comes with the double bolt locking mechanism that add the additional secure to your objects. Besides, it comes in light weight but without doubts, it can work well under pressure. Here is the last best bike lock that we have in our review. It is designed with the steel shackle that resists well with any cutting tools and some average attacks. It includes the cable to secure the front wheel of your bikes. Kryptonite has already updated their bike lock with the hardened cross bar design to secure your bike twice better. Another thing is it is light in weight and strong enough to withstand heavy duty. Looking for the one that can perform well, secure your items well and give no scratches to your bike is how to pick a best bike lock. Each of which above is the 10 best bike locks that we have found highly recommended in the market. It comes with different appearance yet their same purpose is to secure your bike. Grab one and feel free to leave your bike anywhere you want without worrying that your bike will disappear.